Hello all and welcome! 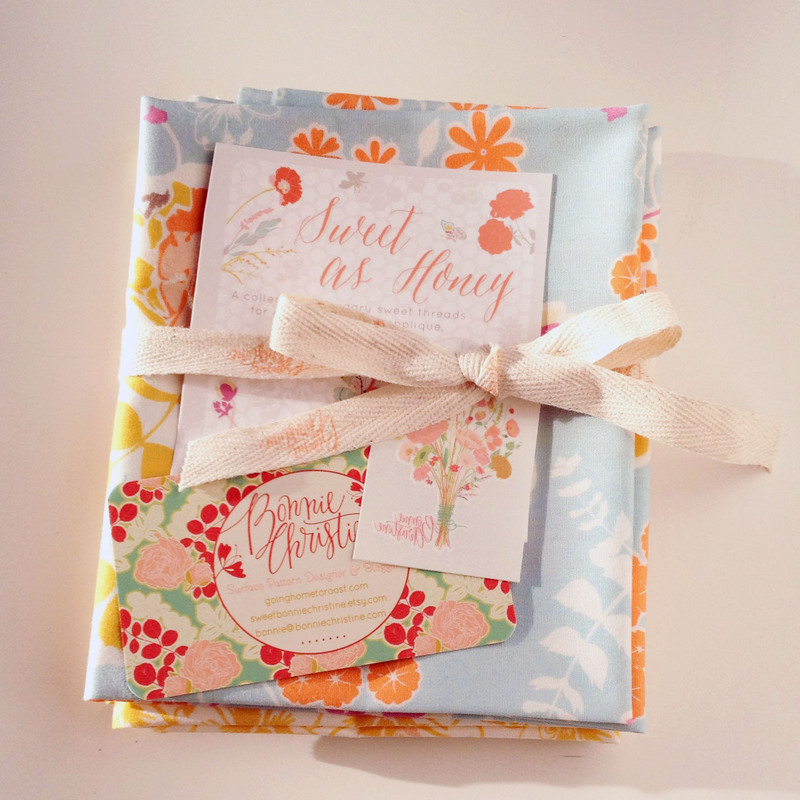 If you’ve been following the Sweet as Honey Blog Tour featuring Bonnie Christine’s Sweet as Honey fabric, thanks for stopping by. I’m honored! I’m Cindy, owner of Schoolhouse Patterns and am so pleased to have been able to participate in the blog tour. I just happened to be on Instagram at the right time and boy, am I glad I was. I got to work with some crazy, slick fabric. Just look at that. 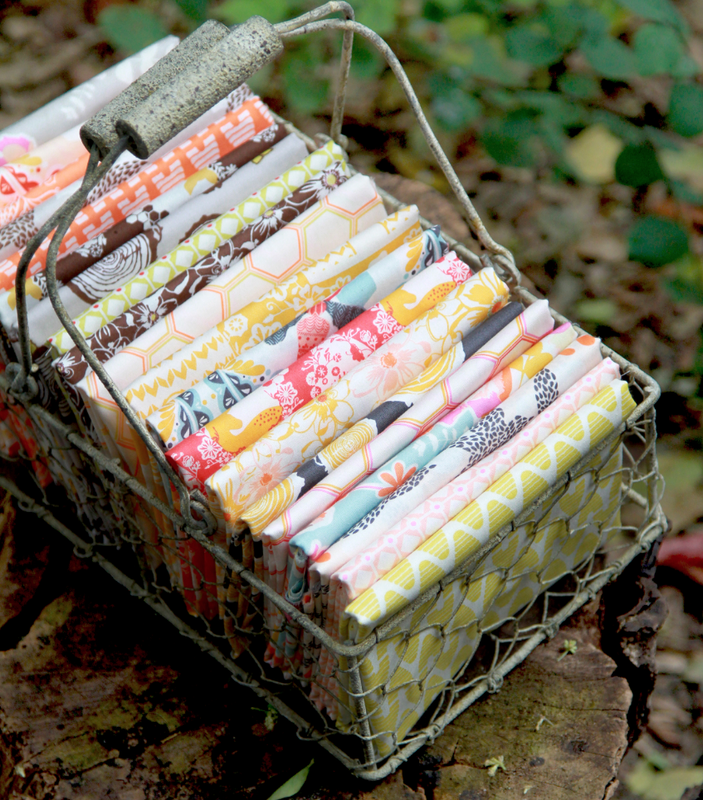 Isn’t that a delicious collection of fat quarters? My fabric came in the mail, just like this. Two fat quarters and two fat eighths, wrapped in a beautiful ribbon, topped with a spool of thread (more about that in a minute) and a sweet press-on tatoo. 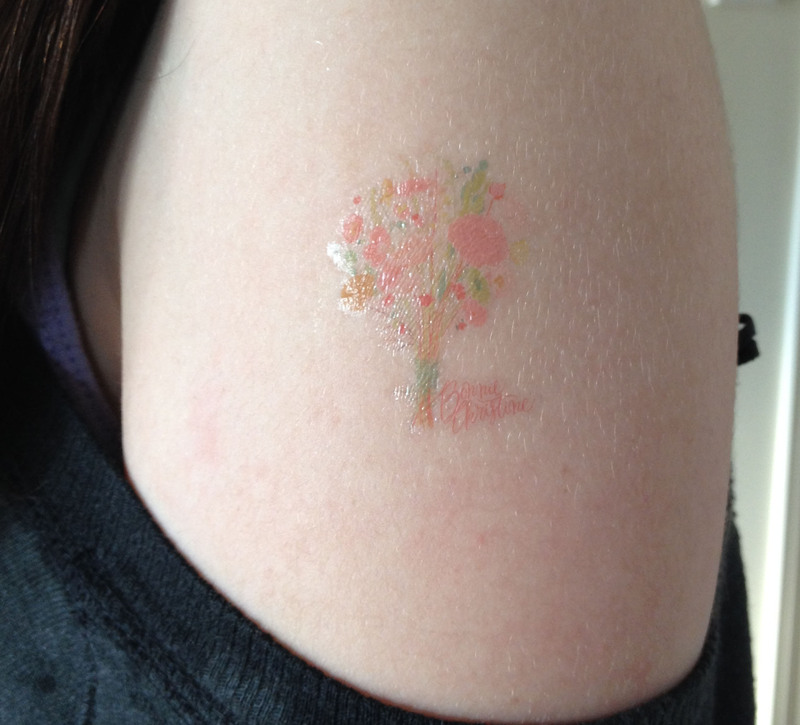 You would not believe the frenzy that ensued when the tatoo was discovered. Four girls, teens and tweens, went nuts for it. The 14 year old won. I bet she didn’t know her shoulder would be on display. Miss Bonnie gave me the choice of the fabric that I would like and I chose Orchard Blossom Spring and Bed of Daisies Golden, both in the Spring Harvest color way. She also threw in the fat eighths of Fly by Night and Cherished Deer Sepia, both of the Autumn Harvest color way. Thank you very much, Bonnie. I haven’t had a chance to work with the latter, but I will, as soon as….whatever. You know how it goes. So, here’s what I have done. I chose to use her fabric to make a bag that I call Granny’s Pocketbook. It’s a new pattern that I just debuted yesterday. You can read all about it here. I paired the beautiful fabric with a soft linen for this bag. I can honestly say that I haven’t worked with a softer, dreamier fabric. The colors are sweet and the texture is heavenly. Sweet as Honey is fantastic. It’s like spring came to my sewing room. I can’t wait to work with the rest. 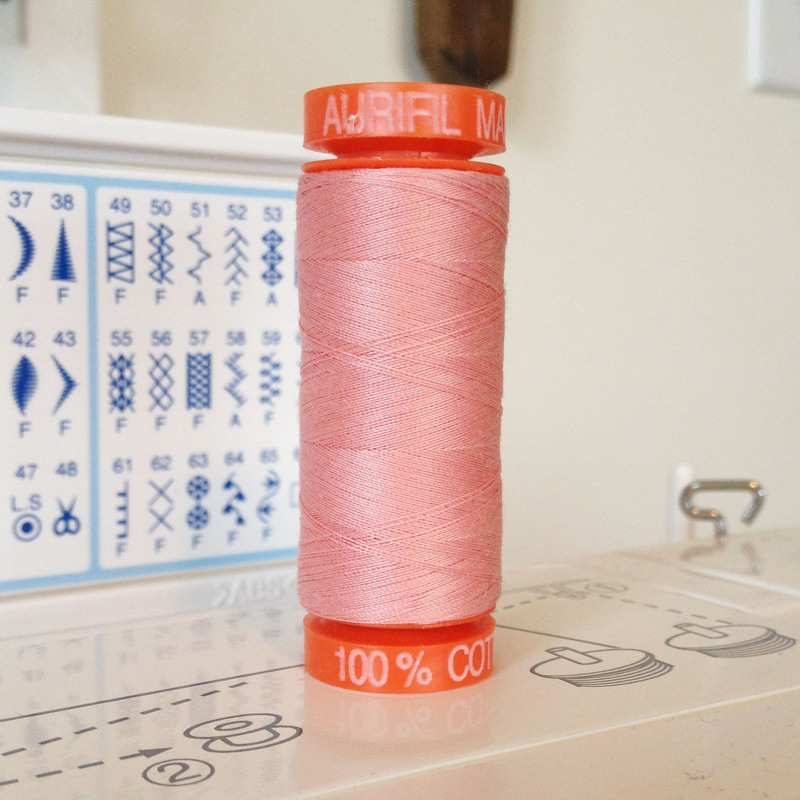 Along with the fabric, Bonnie sent along a spool of Aurifil thread that is part of a coordinating collection. You can see the fabric and thread here. Remember I spoke about the tatoo frenzy? Well, there was another frenzy. I was so surprised and thrilled to be given the thread and I guess I went on and on about it. My girls were a little annoyed by it, I’m sure. You see, I’ve never sewn with Aurifil before and now that I have, I’m ruined. It was dreamy and silky and wonderful. The thread was the perfect companion to the fabric and was great for all of the quilting on the bag. Loved it. I want more. Well, thanks for visiting today. I hope you’re as fired up about Bonnie’s fabric as I am. Be sure to visit Bonnie’s blog here for her turn on the blog tour. She made some gorgeous pillowcases. Also, be sure to visit Melissa at Missouri Mel tomorrow for her installment. I hope that you are all well and that Spring is coming to your sewing rooms too. Thank you Bonnie. It was a pleasure and count me in for next time!! I love this bag, and your quilting gives such a nice finish to it. The linen brings the right touch of sophistication so that it would be perfect for just about anything! Thank you Maxine! I think I might be able to carry it on Easter and it won’t seem out if place. I love your bag, and the story about your Grandmother. Thanks for sharing.